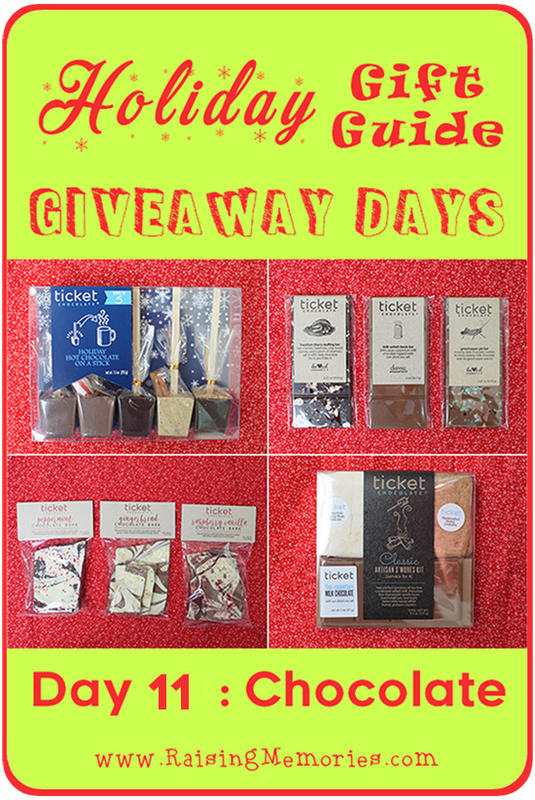 Today we're giving away a Chocolate Gift Basket from Ticket Chocolate! If you missed the announcement, it's Gift Guide Giveaway time and today is Day 11! 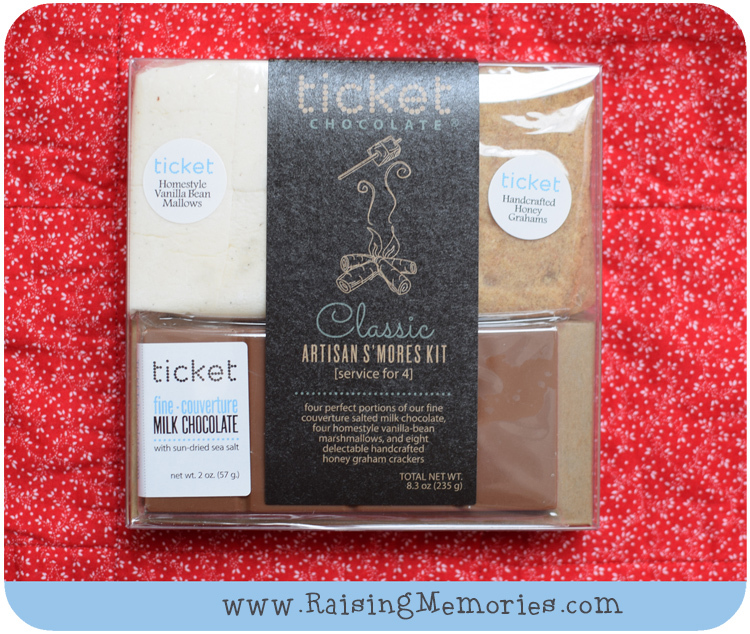 As part of last year's gift guide I shared how my love of Ticket Chocolate began years ago when someone sent me some in the mail and that I loved dipping the chocolate-on-a-stick into steaming milk to create a delicious, gourmet drink. I wanted to share a few of their other products with you, too. These are just a few of their unique chocolate bar flavors: hazelnut cherry stuffing, salted milk chocolate, and grasshopper pie. 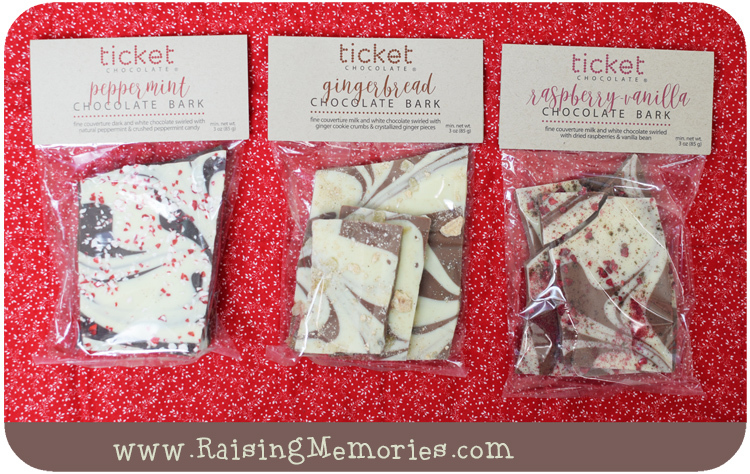 They also sell chocolate bark and I've chosen a few holiday flavors and looks (peppermint, gingerbread, and raspberry vanilla). It's so pretty! How cute are these little S'more kits?! They include their incredibly soft, homemade marshmallows and come in specialty flavors as well (like the peppermint kit I featured last year). 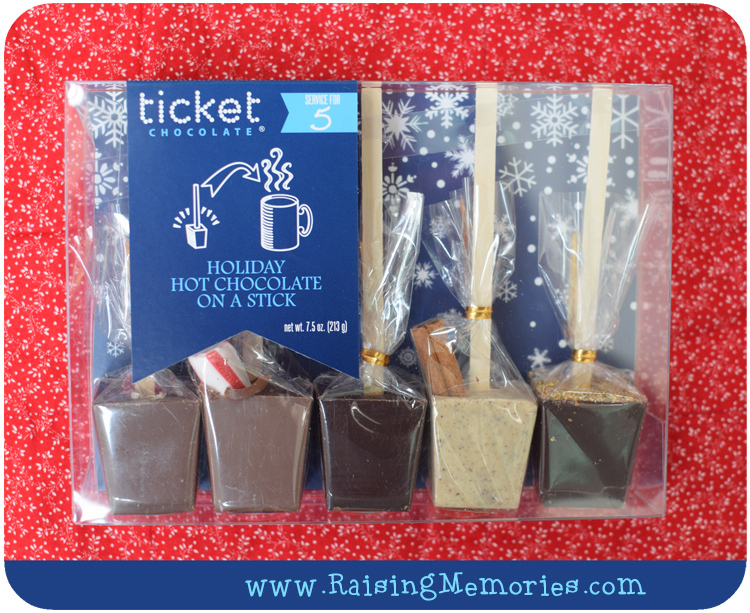 Finally, I could not feature Ticket Chocolate without their hot chocolate on a stick, and this is their holiday package that comes with 5 different flavors: salted caramel, peppermint, hazelnut, spiced apple cider, and orange. A bunch of these products together would make an amazing gift basket, or you could use them separately as smaller gifts, delicious stocking stuffers, or hostess gifts! I would share with my family. I think my kids would love hot chocolate on a stick. I love the s'mores kit too... I might share that with my friend Julie who loves all things s'mores. I'd share with my bff who is a chocoholic! I am not sharing this chocolate. Love chocolate! I would share some of of this delicious chocolate with my brother! I am not so sure about sharing chocolate. Maybe the Christmas spirit would hit me and I will share a little! I would love to share this chocolate with my husband. I'd share with my hubby. Thanks to my dad I am a chocoholic, but unlike him...I don't mind sharing! There is no better person than my wife to split some sweets! I love chocolate, and I would eat it all myself. First of all I have never seen such assortment of chocolates. They all sound so interesting especially for me - big time chocolate lover. I would love to enjoy this with my hubby ! i would share with my niece, she's coming to visit. I have a family who loves chocolate. I would share it with them. I would share the chocolate with my husband. Thanks for the giveaway! I would share my chocolate with my sisters. I would share with my family, why not? Haha. I suppose I'd share with my sweetheart, and our next door neighbor, she loves treats! Id share with my coworker! I would share with my work team. I love chocolate so much, but I would share with my Mom cause I love her more. I would share with friends and my family. I would share this chocolate with my husband. I would share with my sisters and maybe my husband too. 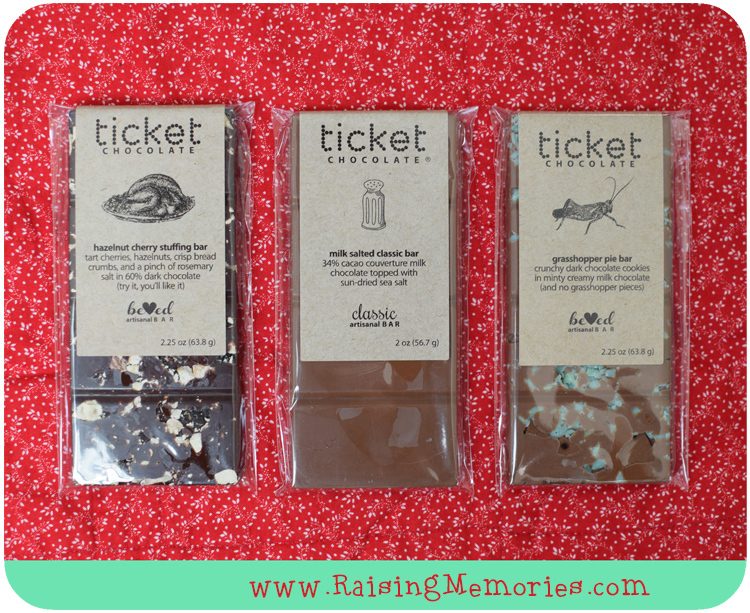 Totally Love Ticket Chocolate and your blog! This would be a Christmas gift for my sister in Maine. Wonder if she would share with me. I would share it with my whole family. They would love it and so would I.
I would share it with my mom. I would share my chocolate with my hubby Ken! I would most definately share with my granddaughter who is a total chocolate freak! lol! I'd absolutely share these with my husband! I'd share the chocolate with kids on holidays! I would share with my kids. I would share this with my children. I would share this with my children! I would share with my husband. I would share with my daughter on our movie night. I would share the chocolate with my twin girls. I would share the chocolate with my roommate! She loves chocolate too.